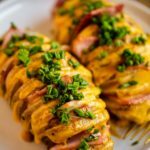 These ham and cheese stuffed Hasselback potatoes are the perfect easy, homemade meal idea! 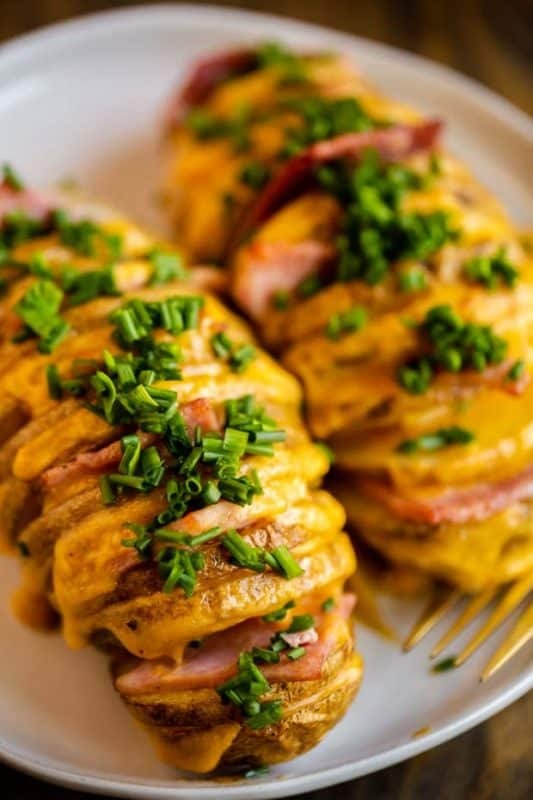 Full of flavor, these crispy, homemade Hasselback potatoes are sliced, loaded with ham and cheese, and oven baked to perfection. A little garlic, butter, and spices help create the best tasty and easy meal that your family will enjoy time and again. 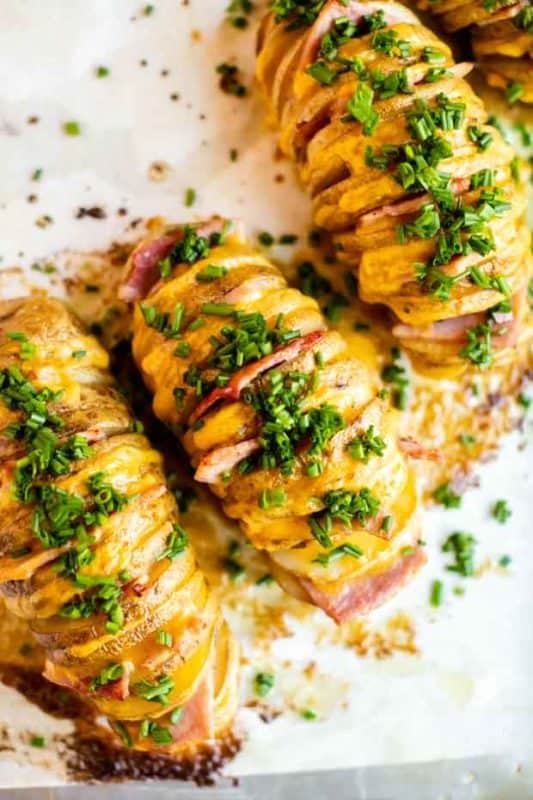 This Hasselback potato recipe looks so fancy, too. It’s a great option to serve to guests as well. Let’s dive in and chat about this simple, wholesome, from scratch recipe a little more! Life is busy these days. There is always lots of work happening with two little kids in school and one big kid in college. Add in household chores, extracurriculars and meal prep, and the days are always jam-packed. Even when we’re extra busy, I still want to make delicious, homemade meals from scratch for my gang. It’s important to serve them the best! We love spending time in the kitchen together — and of course, eating what we’ve prepared. I’m making this happen by picking up high-quality products (like Hillshire Farm® Premium Carved Slow Roasted Seasoned Ham) while doing my grocery shopping at Walmart. 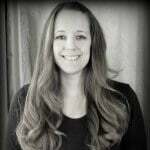 I’m able to order everything we need easily by shopping online and select a pick-up time. I get a confirmation of my order and another confirmation when my order is ready for pickup. I can check in online and then drive into the lot and park. My items are then brought out by a helpful attendant, who loads them into the car for me. It’s brilliant and perfect for those busy days that you don’t want to head into the store. 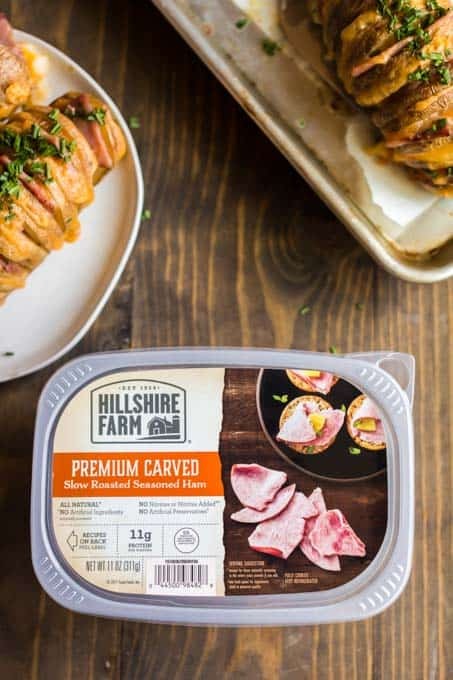 This week, one of the items I popped into my digital cart was Hillshire Farm Premium Carved Slow Roasted Seasoned Ham. 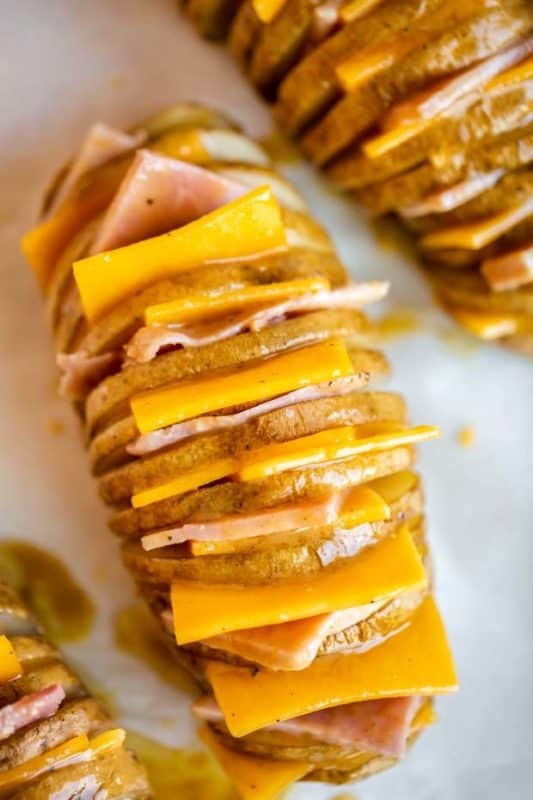 I had this amazing ham and cheddar Hasselback potato recipe I’m sharing with you today in mind and I couldn’t wait to try it. 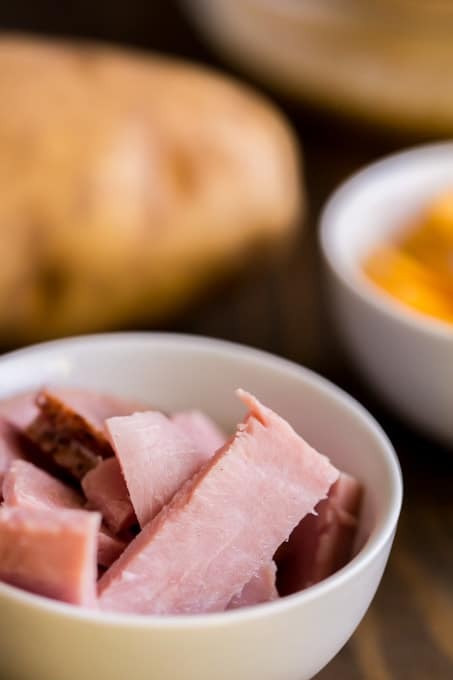 Hillshire Farm Premium Carved Slow Roasted Seasoned Ham is the perfect choice for any recipe. It’s so full of flavor! It’s perfect for snacking on, enjoying in a sandwich, or using in a recipe. It’s located in the packaged lunch meat section in the perimeter coolers. It’s a premium carved cut of high-quality meat. It’s all natural, contains no artificial ingredients, has no added nitrates or nitrites, and also contains no artificial preservatives. It tastes like what you’d pick up freshly carved from the deli counter, but without the deli counter hassle, which is great for my busy mama life. I say it all the time and it’s so true; great quality ingredients mean great tasting recipes! The ideas are endless with help from the Hillshire Farm Brand! Salads, protein or grain bowls with rice and quinoa, sandwiches, wraps, or a meat and cheese appetizer are all made so easy. Since my family loves good potato recipes, I knew this Hasselback recipe was a meal I wanted to try for us. 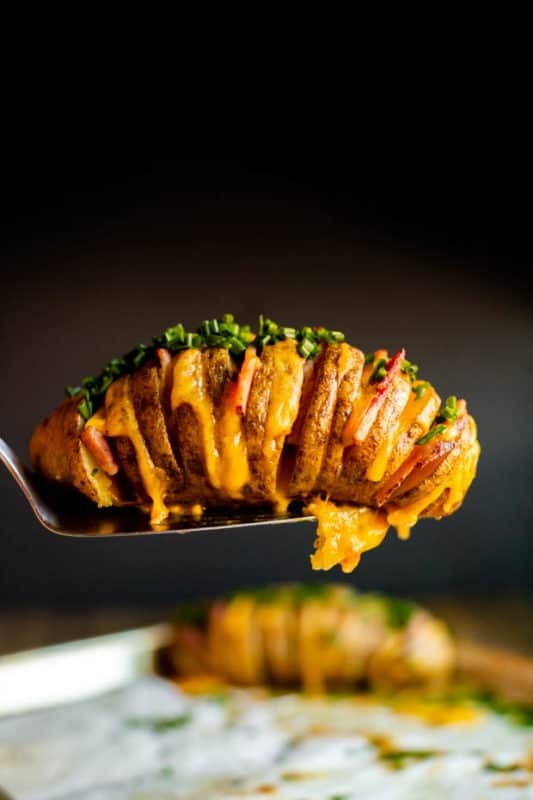 What is a Hasselback Potato? 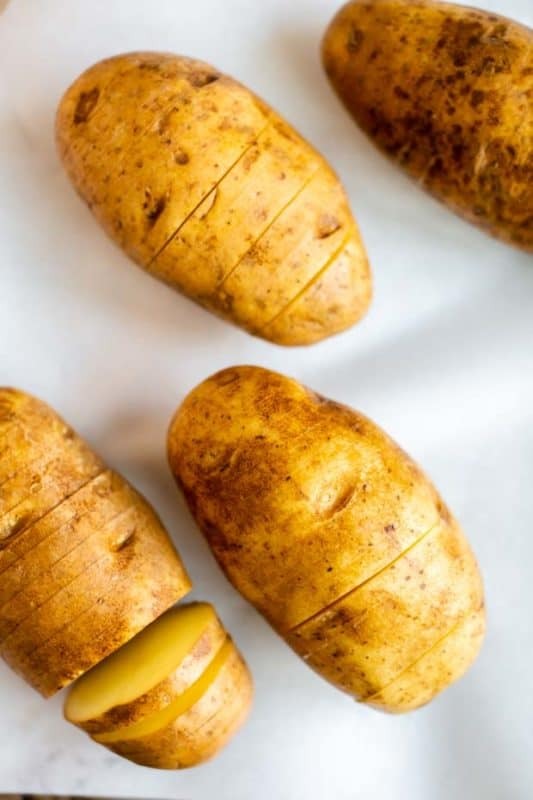 They’re a type of baked potato, where the potatoes are about cut halfway through, into thin slices. Toppings such as butter, breadcrumbs, and almonds are added on top of the potatoes. They’re loaded with flavor and I love how easy they are to customize for your family. What Are the Best Potatoes for Hasselback Potatoes? I prefer to use russet potatoes, but there are several options. You could also use Yukon golds, red potatoes or new potatoes. The biggest trick to making this recipe successful, is making sure to make uniform slices in your potatoes. Otherwise, you risk breaking off part of the potato and it won’t turn out quite so perfect. The best method I’ve found is to place the potato between a pair of chopsticks before slicing. This helps make sure all your slices are the same depth and help keep your potato intact! Thoroughly wash and dry potatoes. Cut off ends, approximately 1 inch. Microwave on high for 15-20 minutes. My potatoes were in the fridge, so I had to microwave them 20 minutes. If you’re starting with room temp potatoes, you may only need 15 minutes. Cut the slices of cheese into quarters and then cut the pieces of Hillshire Farm Premium Carved Slow Roasted Seasoned Ham down to be approximately the same size. 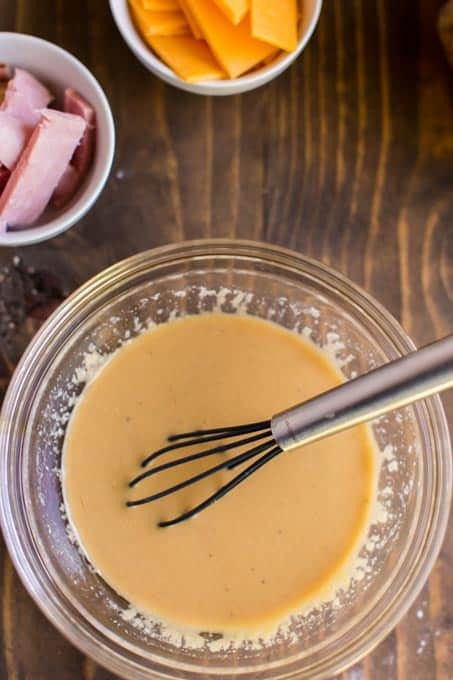 Make the sauce by whisking together all of the sauce ingredients. When the potatoes are fork tender, remove them from the microwave and place on a baking sheet lined with parchment paper. In between each slice of potato, place a piece of cheese and then a piece of Hillshire Farm Premium Carved Slow Roasted Seasoned Ham on the next one. If you want to get crazy you can put a piece of ham AND cheese in between each slice! Brush the potatoes with the sauce. Bake at 450 degrees Fahrenheit for 10 minutes. Remove, and garnish with chopped chives. They’ll be the perfect amount of crispy and cheesy and delicious. So good! 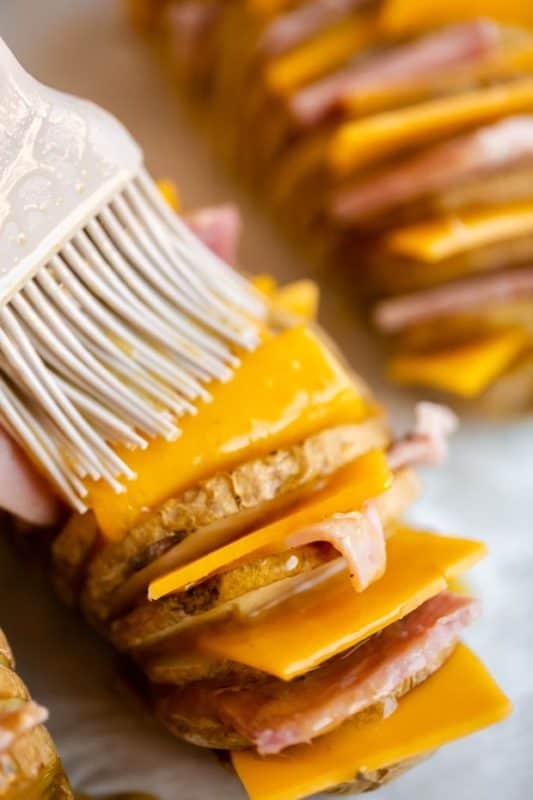 The cheddar along with the ham is an unforgettable, classic flavor that you’ll crave. I love how this recipe turned out. A sprinkle of chopped chives is a big hit for our family. I know some folks love to serve with fresh salsa or sour cream as well. You could also add a little more cheese or even some ranch dressing. Be sure to grab your Hillshire Farm Premium Carved Slow Roasted Seasoned Ham and other ingredients from Walmart and get to cooking. I’m confident your whole family will love these amazing Hasselback potatoes — they’re the best! Microwave on high for 15-20 minutes. My potatoes were in the fridge so I had to microwave them 20 minutes. If you’re starting with room temp potatoes you may only need 15 minutes. Bake at 450* for 10 minutes. Remove and garnish with chopped chives. Such an easy, delicious meal!